With Federal and State Government funding to the tune of $260.5 million, Queensland’s Cape York Regional Package aims to provide local communities greater employment and development opportunities, along with better infrastructure, freight and tourist access and reduced maintenance costs. The package consists of a $200 million investment to seal the Peninsula Development Road (PDR), a further $10 million to seal the Endeavour Valley Road through to Hope Vale and $50.5 million for community infrastructure works. Awarded the 22-kilometre Coen South stretch of the PDR project, Koppen Developments is a Cairns-based civil construction firm that has been in business for more than 80 years supplying land development, civil earthworks and infrastructure services throughout Northern Queensland. Upon completion, Coen residents and other motorists travelling in the area will have access to a 53.5-kilometre stretch of uninterrupted sealed road. With employment and development central to the project’s success in the area, Koppen has also been actively involved in supporting the local community by offering training and job opportunities to local Indigenous and non-Indigenous residents. To deliver the project, Koppen is making use of the latest in survey and machine control technology to save time, reduce material waste and increase safety and accuracy across all aspects of the construction process. “We run Topcon machine control and survey equipment for all our earthmoving and as-built checks,” explains Koppens Director Scott Koppen. “Initially we started off the project last year using Topcon GPS systems on our excavators to shape the batters. Now that the wet season is over, we’re back up and running, with four graders, a paver and a milling machine all working to design with Topcon technology,” he adds. 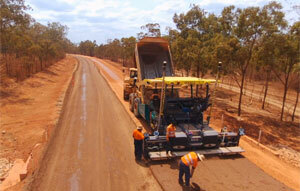 Koppens is currently running Topcon Millimetre GPS systems across its graders, paver and milling machine. The technology is designed to deliver extremely fine tolerance accuracy through a combination of GNSS and laser systems. Unlike other solutions that rely on optical total station-based positioning technology, this unique platform delivers 300 per cent greater accuracy than standalone GNSS and can enable multiple machines to operate simultaneously within what’s referred to as a zone of connectivity. A specially designed laser transmitter that emits a high vertical and wide horizontal wall of light, connects to a pole-mounted laser receiver on the machine. Linking up to four laser transmitters can deliver a working range of 2.4 kilometres horizontally and 40 metres elevation. Combined with high precision, multi-constellation GNSS positioning technology, this delivers millimetre-level accuracy anywhere within the working zone. Installed on a Vögele 1800-3 paver, Topcon’s mmGPS technology is delivering high accuracy due to its ability to connect directly to the machine’s CAN system. “These days the CAN connectivity adds significant performance improvements and greatly improves the responsiveness of the machine in relation to the design it’s working to,” says Mr. Koppen. 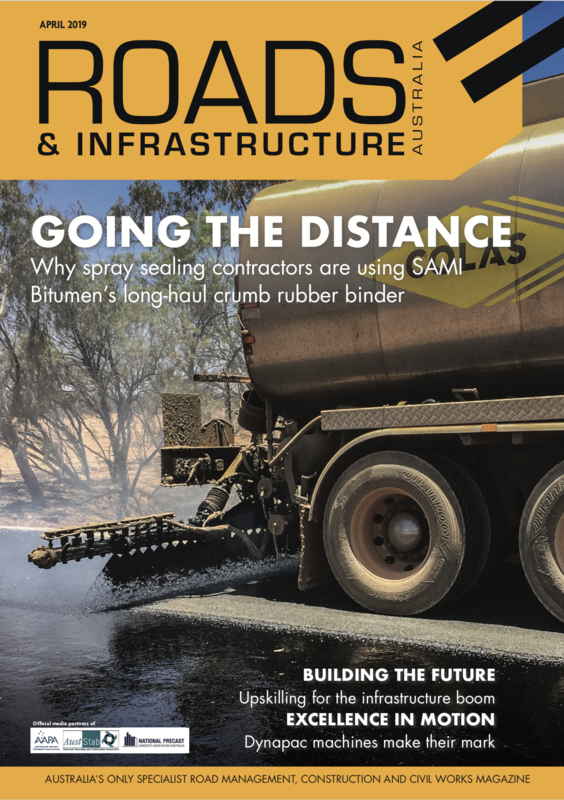 “We are eagerly anticipating the arrival of our new Smoothride paving system as it will enable us to spread thicker layers of material and change compaction densities, let alone the benefits it offers for milling applications and bitumen stabilising work,” he adds. Koppen Developments will be one of the first Australian companies to deploy Topcon’s new Smoothride solution, which includes newly developed paving and milling software along with real-time surface profiling via a vehicle-mounted scanner. Position Partners installed the first Smoothride system in the Asia Pacific region on four paving systems in Singapore as part of the Changi airport expansion project and will soon bring the technology to Australian shores. As an early adopter of new technology, Mr. Koppen accepts that things are not always easy from the beginning. “GPS isn’t like buying a car when you don’t need to see the dealer again until you want an upgrade. It’s a complex solution that requires expertise to support it.” Support from Position Partners has always been a central reason behind Koppen’s choice of positioning and machine control technology and the company regularly uses Tokara, a remote support and telematics platform that Position Partners specifically developed for the Australian market. Tokara also enables surveyors and project managers to send design file updates direct to machines and field survey parties without the need to transfer them in person via USB. “We don’t tend to use the file transfer ourselves as we simply transfer the design files from the client or the surveyor. To us, the main value of Tokara is in the support it provides us when we need it,” adds Mr. Koppen.